Los Cabos, Mexico (Dec. 3, 2018) – Pueblo Bonito Golf & Spa Resorts has announced the appointment of Lawrence Tuck as General Manager of Pueblo Bonito Pacifica Golf & Spa Resort. Tuck, a 14-year veteran of the hospitality industry, has worked in all areas of resort operations and for several major luxury brands. He most recently was Resort Manager of the Four Seasons Resort Nevis, where he achieved record-breaking service scores and continued the resort’s AAA Five Diamond standards by focusing on detail and service standards. Tuck was also Resort Manager of the Hilton Seychelles Labriz Resort & Spa. Canadian-born, English- and Spanish-speaking, Tuck also has worked for Fairmont, Sofitel, InterContinental, and Westin in all corners of the world including Asia, Mexico, Canada and Africa. Based on his strong culinary background, he is highly skilled in catering, restaurant management, food & beverage, banquet operations and hospitality management. Nestled on a secluded three-mile stretch of pristine beach in Cabo San Lucas, Pueblo Bonito Pacifica Golf & Spa Resort is a luxury all-inclusive resort catering exclusively to adults seeking a tranquil oceanfront hideaway. A modern yet elegant approach to design and architecture presents an ideal setting for a memorable vacation of relaxation and self-renewal. The 201-room boutique retreat features four restaurants, four bars, the Armonia wellness-inspired spa, and access to a private beach. In 2016 Pueblo Bonito Pacifica unveiled The Towers at Pacifica, three new ultra-luxury buildings that feature enhanced amenities and first-class personalized service, including 24-hour British Butler Institute-certified butler service to attend to any and all guest needs. The Towers at Pacifica includes an exclusive VIP lounge offering culinary experiences and specialty cocktails, state-of-the-art gym and Peninsula, a gourmet restaurant – all with dramatic oceanfront views. The Resort is situated within the exclusive residential development of Quivira Los Cabos, located five minutes from the spectacular Jack Nicklaus-designed course at Quivira Golf Club and 10 minutes from downtown Cabo San Lucas. For additional information on Pueblo Bonito Pacifica access the web site at www.pueblobonito.com. Pueblo Bonito Golf & Spa has eight award-winning resorts in two destinations, Cabo San Lucas and Mazatlán, all offering luxury all-inclusive options. Each of the properties has its own personality, design and ambiance, yet all share the same high level of impeccable quality and distinguished atmosphere. In Cabo San Lucas, the adults-only Pueblo Bonito Pacifica Golf & Spa Resort is the ideal setting for a romantic getaway, while Pueblo Bonito Sunset Beach Golf & Spa Resort, with its large, all ocean-view suites, is perfect for families. 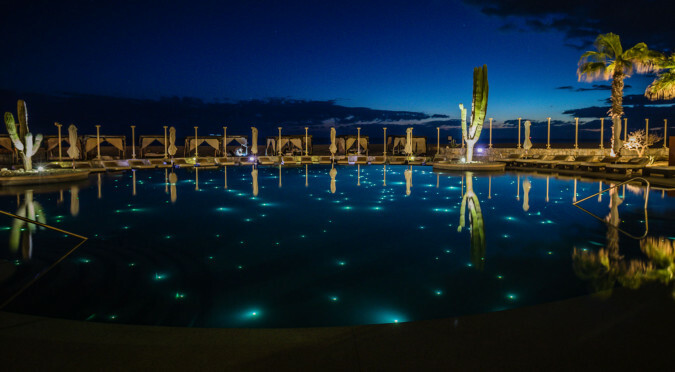 Pueblo Bonito Rosé Resort & Spa and Pueblo Bonito Los Cabos, both located on El Médano beach, have the best to offer vacationers looking to be right in the middle of all the Cabo action. In Mazatlán, the elegant jewel Pueblo Bonito Emerald Bay Resort & Spa overlooks the Pacific Ocean and a private beach, while the charming Pueblo Bonito Mazatlán, is located in the famous Golden Zone. Both resorts are great for family vacations and romantic getaways. For more information visit www.pueblobonito.com, find us on Facebook at www.facebook.com/pueblobonitoresort and follow us on Twitter @PuebloBonito.